Olympic were given their name in 1963 while they were regularly performing at one of the ‘hippest’ venues in Prague of that time, the music club Olympik. They were no newcomers, though. Since the late 1950s the’d been playing in legendary rock’n’roll groups like Sputnici, Samuels or later Karkulka. In June 1963 the Big Beat Quintet – an offspring of Sputnici featuring three future Olympic members – had even recorded one of the first genuine rock’n’roll singles for the Supraphon label. But the actual launch of their unprecedented professional career was November 11, 1963 when Olympic debuted as the house band for the first rock’n’roll musical “Ondráš podotýká”, at the renowned Semafor Theatre. This early line-up comprised about seven musicians, including a saxophonist. In the spring of 1964 Olympic entered the Supraphon recording studios for the first time, and they instantly made Czech music history again. The resulting “big beat” series of 7” singles was released in collaboration with the popular Mladý svet (Young World) magazine, with Olympic backing top Czech vocalists on four records out of five, including Eva Pilarová and Karel Gott. Olympic initially continued to work for Supraphon as a backing band on several singles whenever the fashionable rock backbeat was required. Yet for themselves they had chosen another pioneering path: instead of slavishly performing cover versions of Western hits like the majority of other Czech beat groups, they began to write and sing their own songs with Czech lyrics. At this point the group reduced their line-up to a quintet, only occasionally adding a guest vocalist. Lead guitarist Petr Janda took over the band’s leadership. Founding members Miroslav Berka on keyboards with bass guitarist Pavel Chrastina were joined by Ladislav Klein on rhythm guitar. The original drummer František “Ringo” Cech was eventually replaced by the previously alternating Jan Antonín Pacák aka Jenýk. Between 1965 and 1967 they recorded a string of hits which still serve as the backbone of their live repertoire until these days, including ‘Vzpomínka plíživá’ and ‘Želva’. But the group’s next big thing and another “first” was yet to come. 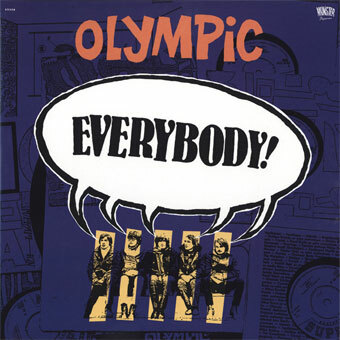 Supraphon had already made shy excursions into the rock territory with a few primarily export-oriented LP compilations, among others also featuring Olympic. In 1967 the group was offered to record the first ever Czechoslovak profile beat album. The recording sessions took place between January and October 1967, and the LP “Želva” (The Tortoise) was released in early 1968. The demand was overwhelming. During the Soviet invasion of Czechoslovakia in August 1968 Olympic were on holidays in France. They prolonged their stay and began gigging French beat clubs, and they even recorded an EP under the name Five Travellers. However, they missed a chance for an international breakthrough when they declined an offer from Johnny Hallyday to perform as his supporting act on a concert series in Paris, and instead the group decided to return home. The second Supraphon album, ‘Pták Rosomák’ (The Bird Wolverine), was recorded in December 1968 and January 1969. Apart from loads of hip psychedelia, it also included earlier hits like ‘Krásná neznámá’ and the title track, and again it was an enormous success on the domestic market. Later that spring, the bassist and main lyricist Chrastina quitted the group. He was replaced by Jan “Papírek” Hauser. The band revisited France to work on a new record but it was eventually cancelled (it remained unreleased until 2011). After considering emigration at first, Olympic definitely returned to Prague in August 1969, in spite of the cheerless political situation. Since they weren’t a band with many “offending” messages or with an overly rebellious attitude, the communist censors let them carry on. ‘Kufr’ was a hit in late 1969, and even bigger hits followed in 1970 in form of more pop-oriented songs. “Jedeme, jedeme” (Riding On, Riding On) was their third album for Supraphon, recorded in September 1970. It contained fresh versions of several songs originally written for the previously cancelled French LP, and it shows a slight shift towards progressive rock. It was the last album to feature Pacák and Hauser, who both left the group before the record was even released in 1971. Olympic then recruited the ex-Golden Kids drummer Petr Hejduk and the former Rebels vocalist and bassist Jirí Korn, but that was already the end of the “classic” Olympic era. Double LP release!! !